It’s finally spring! I love how fresh and new everything seems outside….and it makes me want to re-fresh my home too! 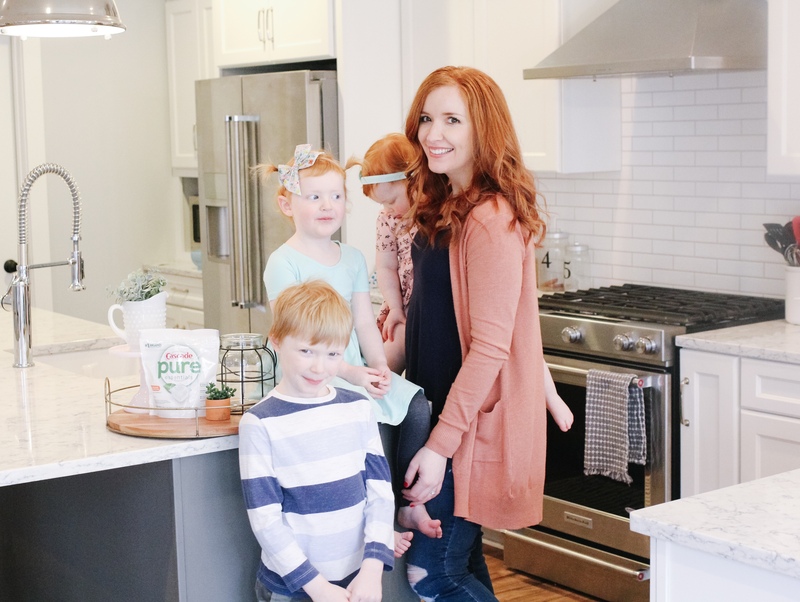 As a busy mom of three, right now is not really a season in my life where I have it all together. Especially when it comes to cleaning. My life is a balancing act where I’m juggling so many things at once, and just trying to keep everything running smoothly. Over the past few years I’ve realized that one way to keep my head clear and focused is to have a clean home. Does that sound crazy? On days where my house is a mess (which, let’s be real, is daily) I feel overwhelmed and have trouble focusing. 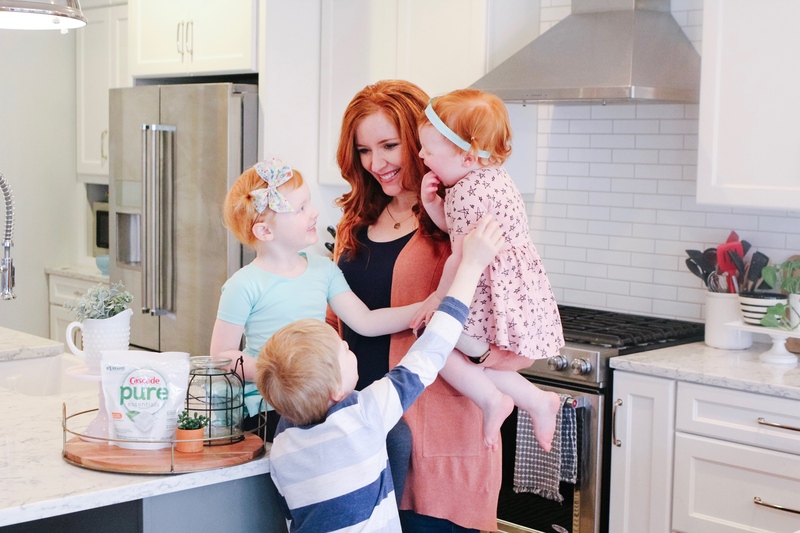 But when I have a clean home (or semi-clean home), I feel more organized, can see what needs to be done, and can enjoy just playing with my children. So today I thought I would share my 12 simple cleaning tips if you are a busy mom like me. I hope they help give some insight into our cleaning routine, and how I approach keeping things running smoothly (most of the time). 1. Make a cleaning schedule. And write it down! 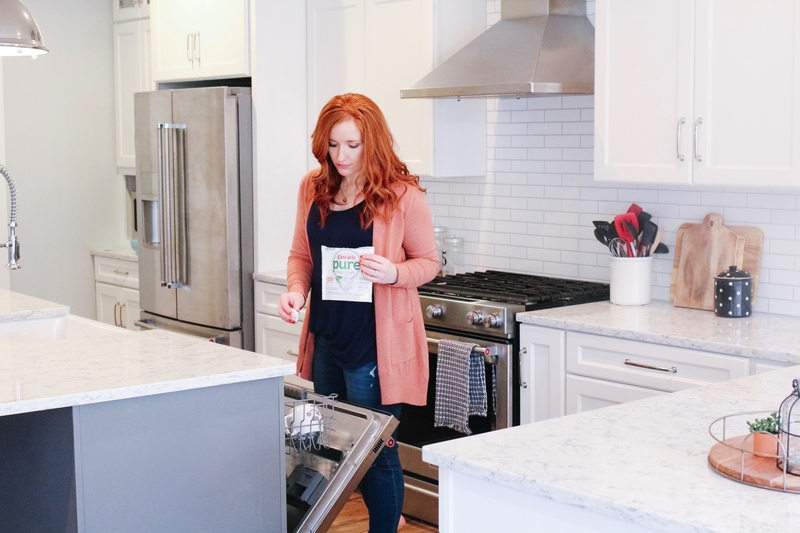 Before I used a cleaning schedule, I would jump around from task to task, never fully finishing one thing before feeling overwhelmed and jumping to the next. I never really knew what I should be cleaning. And because of that, I was spending my time very inefficiently. Using a cleaning schedule allows you to jot down the daily and weekly cleaning tasks that are important and need to get done, as well as serves as a guideline to help you get those tasks done throughout your day. For example, trash day is Wednesdays, so on Tuesdays I always make sure I take the time to clean out our refrigerator of old and expired food, and empty all of the bathroom trash cans. 2. Clean as you go. 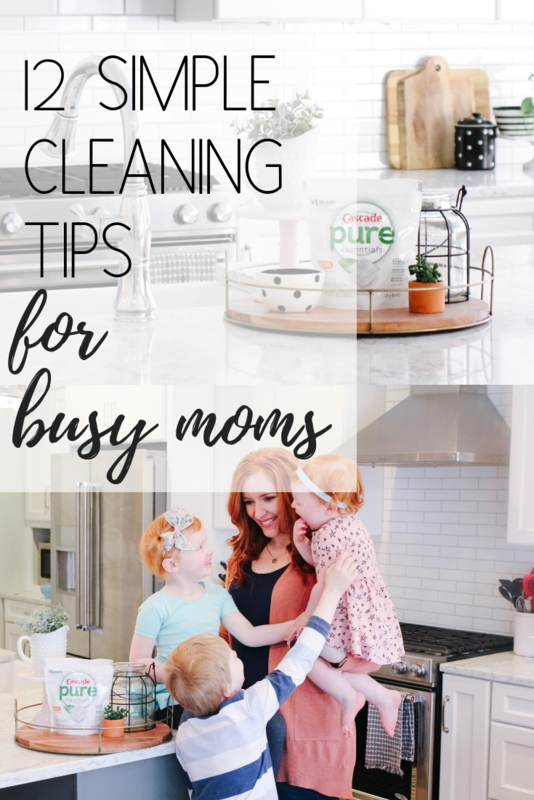 I know that cleaning things up as soon as you’re done with them is always the best, but as a busy mom that’s just not always an option. This is where you need to cut yourself a little slack. If you can quickly help your kids clean up their paints and papers before moving on to the next activity, great. If it causes a melt-down of epic proportions because nap time is around the corner, then let it go. Clean what you can, when you can. And don’t sweat the small stuff. 3. Load the dishes in the dishwasher right away. One of the biggest culprits of an unclean and messy house is dishes. Whether that be dishes piling up on the counter or scattered in the different rooms of the house, when I see dishes throughout our house, I instantly think the entire room looks messier. To avoid this, try to put dishes into the dishwasher as soon as you’re done with them. 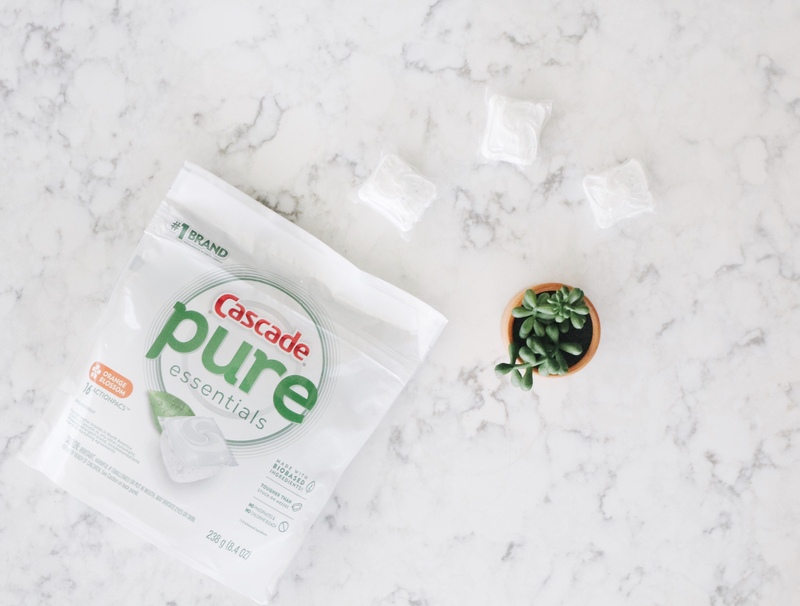 We recently switched to new Cascade pure essentials ActionPacs to use in our dishwasher and they are LIFECHANGING. How did I do dishes before these amazing ActionPacs? The newly simplified formula leaves my dishes sparkling clean with zero effort from me! I simply drop one pac in to the compartment of my washing machine and set it to run. 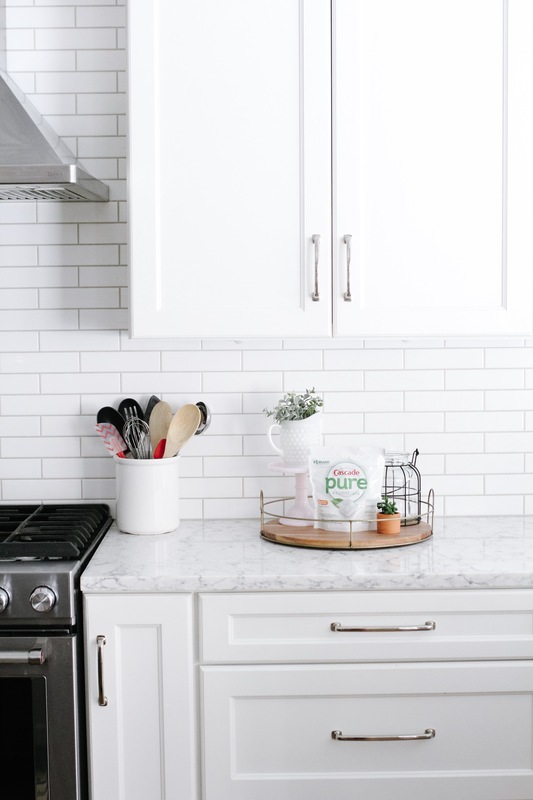 Like all Cascade products, the pure essentials ActionPacs work hard to clean my dishes and silverware and is a product I can feel good about using in my home. 4. Invest in a hand-held vacuum. This is a must-have for every mom. 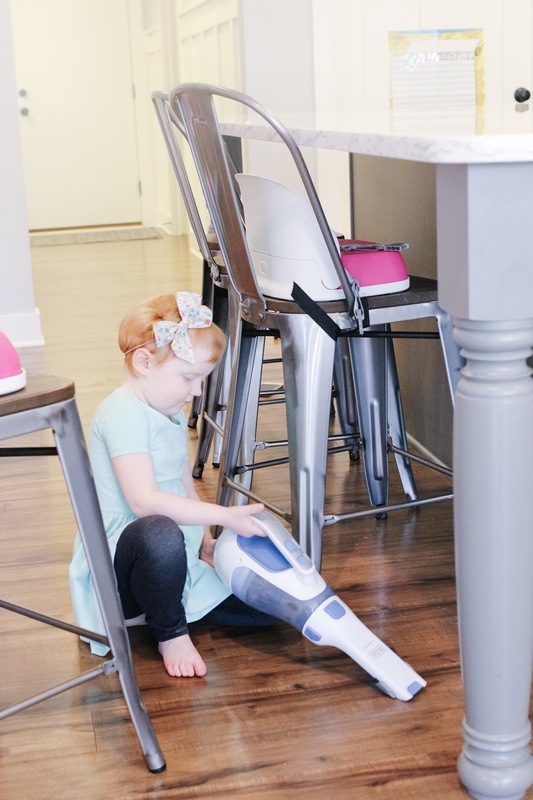 Instead of letting little tiny messes sit until you can pull out your big vacuum, have one of your kids zap those tiny messes and crumbs right away with a hand-held vacuum. I keep ours in the kitchen for easy clean ups in between vacuuming sessions. 5. Prioritize cleaning tasks. This will save you a lot of time when it comes to cleaning your house on a tight schedule. Learning which tasks are important, and which ones can be left until you have more time is key. If you’re struggling to know which tasks are important and which ones can wait, make a list of your “musts”. In our house, we MUST have clean kitchen counters, clean dishes, and clean bathrooms. Those are always my top priorities when cleaning our home, so I focus on them first. 6. Clean up where you are. If you are sitting at your desk working and notice you’re starting to get a lot of paper clutter, take a quick 5 minute break and speed clean your desk off, putting important papers where they belong. After kissing the kids goodnight, quickly pick up the dirty socks that were tossed on the ground. While supervising baths and showers, spend two minutes wiping down the bathroom counters and put things away. 7. Do the laundry every day. Yes. EVERY. DAY. I still remember being newly married and only doing laundry on the weekend…and it was no big deal. But now that we are a family of five, one load per day is the only way I’ve been able to survive laundry. If I skip a few days the laundry piles up crazy fast and I get overwhelmed at the mountains of clothes staring at me. Doing one load every day keeps me on top of things and makes laundry way easier. No more hours and hours spent doing laundry! 8. Keep cleaning supplies where you use them. It seems like common sense, right? But it took me a while to actually do this. I keep bathroom cleaning supplies in each of our bathrooms so that I don’t have to run around the house looking for what I need. This really helps me clean as I go! 9. Wash toys in the dishwasher. Did you know you could do this? It’s easy! I just make sure they are toys that can stand the hot temperatures. I like to toss them in a mesh laundry bag and stick them on the top rack of my dishwasher. Toss in your Cascade pure essentials ActionPac and you are set to go! Such a lifesaver if you have little ones constantly putting toys in their mouth! 10. Use vinegar as a natural cleaner. I do this ALL THE TIME and my husband totally makes fun of me…but a little vinegar mixed with water is such a great cleaner! And it’s safe! I always give a squirt bottle of vinegar and water to my kids so they can “help” me clean. 11. Get the kids involved! After dinner we typically have a family clean up time for about 10 minutes or so. Hand one of my kids their own cleaning caddy, a squirt bottle, and a cleaning cloth and they think they are SO cool. My kids like to clean their art table, our baseboards, and the floors. We put on some music and clean for about 10 minutes each day….they love it! 12. LET IT GO. I have officially given myself permission to let some stuff go. And now I’m giving you permission to do the same. This season of little children (and the big messes they create) in my house is brief. My house is not always picture perfect. Some days it looks like a mini tornado just hit our kitchen. And that’s okay. It won’t always be like this. So let it go. 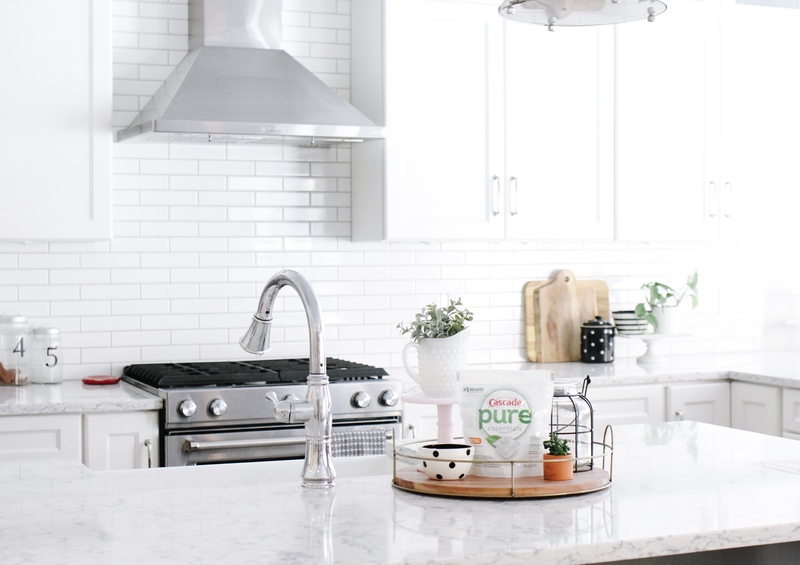 When it comes to keeping my dishes clean, I love that with Cascade pure essentials, there are no tradeoffs: I don’t have to compromise quality performance for ingredients I feel good about using in my home. It’s a mom must-have in our house! 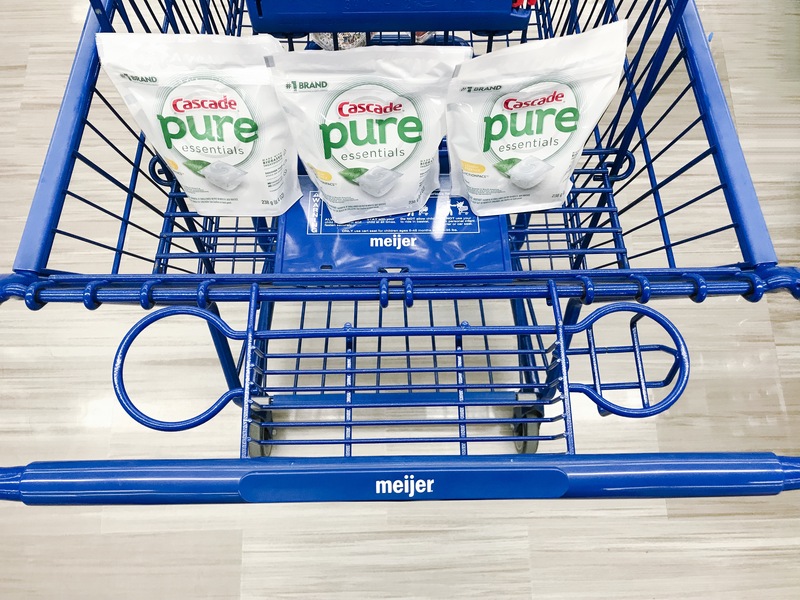 Plus, there’s even more great news: Now through the month of April, you can receive $1 off a Cascade pure essentials (bag or tub) using the Meijer mPerks App! Bags of the action pacs are currently available (which is what I use!) and the tubs will be available starting April 14th! Also, in honor of Earth Day on April 22nd, Meijer is offering buy one, get one 30% off all pure essentials from 4/14-4/20 available at checkout. I will for sure be visiting Meijer to stock up on this must-have for our home! This post is sponsored by Cascade, but all opinions are my own. I like the idea of washing toys in the dishwasher! They don’t get disinfected often enough. As far as a cleaning schedule, I’ve been putting that one off. I know deep down that it’s key to having a cleaner house. Oh I LOVE the idea of putting the toys in the dishwasher to sterilize them! Going to pass that tip onto my siblings to do for my nieces and nephews. 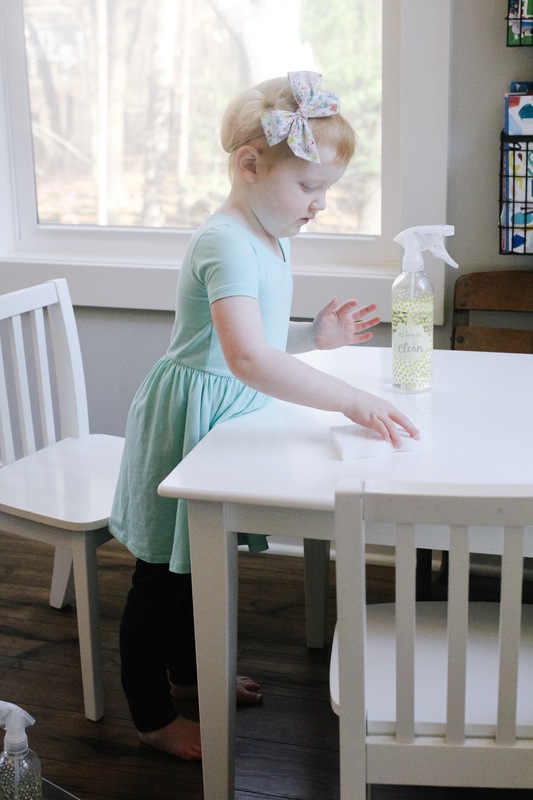 I love how you get your kids involved in cleaning! Maybe I should think about doing that instead of always doing it myself. I like your idea of getting a hand held vacuum instead of pulling out the big vacuum each time. These are wonderful tips. Some of these I already do and there were I few I learned just now. Thanks so much for the tips! Oh gosh I can SO relate to this post! Love your tips! These are such amazing tips for moms! And I’ll have to try the pure essentials products, I bet I would love them! Oh I didn’t know Cascade had a line of product like this! I’ll have to pick some up!